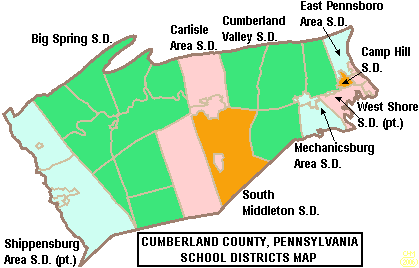 Cumberland County is a county located in the U.S. state of Pennsylvania. As of the 2010 census, the population was 235,406. Its county seat is Carlisle. Cumberland County is included in the Harrisburg-Carlisle, PA Metropolitan Statistical Area. Cumberland County was first settled by a majority of Scots-Irish immigrants who arrived in this area about 1730. English and German settlers constituted about ten percent of the early population. The settlers originally mostly devoted the area to farming and later developed other trades. 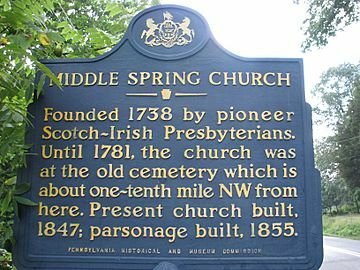 These settlers built the Middle Spring Presbyterian Church, among the oldest houses of worship in central Pennsylvania, in 1738 near present-day Shippensburg, Pennsylvania. The General Assembly (legislature) of the Pennsylvania colony on January 27, 1750, created Cumberland County from Lancaster County, Pennsylvania, naming it for Cumberland, England. Its county seat is Carlisle. The county also lies within the Cumberland Valley adjoining the Susquehanna River at its eastern border, stretching approximately 42 miles from the borough of Shippensburg on the west to the Susquehanna River in east Cumberland County. The oldest towns in the county are Shippensburg, Pennsylvania, and Carlisle, Pennsylvania, each with its unique history. Shippensburg is home to Shippensburg University of Pennsylvania, one of 14 universities of the Pennsylvania State System of Higher Education. Carlisle is also home to Dickinson College, established in 1773, and the Penn State Dickinson School of Law. The United States Army War College is a United States Army school located in Carlisle, Pennsylvania, on the 500 acre (2 km²) campus of the historic Carlisle Barracks, a military post dating back to the 1770s. It caters to high-level military personnel and civilians and prepares them for strategic leadership responsibilities. It is the U. S. Army's most senior military educational institution. During the Gettysburg campaign of the American Civil War in the summer of 1863, Confederate troops marched through the Cumberland Valley, briefly occupying much of Cumberland County. In the 20th century, the suburbs of Harrisburg, Pennsylvania, the state capital, expanded extensively into eastern Cumberland County. Carlisle also developed suburbs in adjoining townships. According to the U.S. Census Bureau, the county has a total area of 550 square miles (1,400 km2), of which 545 square miles (1,410 km2) is land and 4.8 square miles (12 km2) (0.9%) is water. As of the census of 2000, there were 213,674 people, 83,015 households, and 56,118 families residing in the county. The population density was 388 people per square mile (150/km²). There were 86,951 housing units at an average density of 158 per square mile (61/km²). The racial makeup of the county was 94.40% White, 2.36% Black or African American, 0.13% Native American, 1.67% Asian, 0.04% Pacific Islander, 0.43% from other races, and 0.97% from two or more races. 1.35% of the population were Hispanic or Latino of any race. 35.3% were of German, 10.6% American, 10.1% Irish, 7.5% English and 6.8% Italian ancestry according to Census 2000. 94.7% spoke English and 1.4% Spanish as their first language. There were 83,015 households out of which 29.50% had children under the age of 18 living with them, 56.50% were married couples living together, 8.00% had a female householder with no husband present, and 32.40% were non-families. 26.70% of all households were made up of individuals and 10.30% had someone living alone who was 65 years of age or older. The average household size was 2.41 and the average family size was 2.92. In the county, the population was spread out with 22.00% under the age of 18, 10.60% from 18 to 24, 28.50% from 25 to 44, 24.10% from 45 to 64, and 14.90% who were 65 years of age or older. The median age was 38 years. For every 100 females there were 95.20 males. For every 100 females age 18 and over, there were 92.70 males. Its per capita income is $31,627, making it the wealthiest Pennsylvania county outside greater Philadelphia, and fifth wealthiest overall. The United States Office of Management and Budget has designated Cumberland County as the Harrisburg-Carlisle, PA Metropolitan Statistical Area (MSA). As of the 2010 U.S. Census the metropolitan area ranked 6th most populous in the State of Pennsylvania and the 96th most populous in the United States with a population of 549,475. Cumberland County is also a part of the larger Harrisburg-York-Lebanon, PA Combined Statistical Area (CSA), which combines the populations of Cumberland County as well as Adams, Dauphin, Lebanon, Perry and York Counties in Pennsylvania. The Combined Statistical Area ranked 5th in the State of Pennsylvania and 43rd most populous in the United States with a population of 1,219,422. 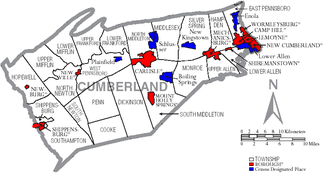 Map of Cumberland County, Pennsylvania with Municipal Labels showing Boroughs (red), Townships (white), and Census-designated places (blue). The population ranking of the following table is based on the 2010 census of Cumberland County. Cumberland County, Pennsylvania Facts for Kids. Kiddle Encyclopedia.